One of the key events necessary to trigger the end-of-days scenario expected in the Christian end-time theology, known as apocalyptic premillennial dispensationalism, that is held by Pastor John Hagee, much of his CUFI membership and tens of millions of Americans, is the rebuilding of a third Jewish temple on Jerusalem's Temple Mount, a spot considered one of the most highly charged possible flash points of conflict on Earth. Thus, one of the central organizational responsibilities of Israel's domestic security force, Shin Bet, is to prevent possible attacks, on the Islamic structures on and around Jerusalem's Temple Mount, by Jewish or Christian, or even Islamic, terrorist groups. In his 2002 book The End of Days: Fundamentalism and the Struggle for the Temple Mount Israeli Journalist Gershom Gorenberg analyzes the volatile religious significance of the Temple Mount. As the Oxford University Press summarizes, "Members of the world's three major monotheistic faiths--Judaism, Christianity, and Islam--hold this spot to be the key to salvation as they await the end of the world", and as a Publisher's Weekly review describes Gorenberg's work, "Jewish messianists and Christian millennialists insist that building the Third Temple on the site where both Solomon's and Herod's temples stood is essential for the advent of the Messiah, while Muslim apocalyptic believers fear that efforts to destroy Al-Aqsa mosque to make way for the Third Temple will prevent fulfillment of the prophecy about Islam's Meccan shrine migrating to Jerusalem at the end of time... Gorenberg's prescience is manifest by his calling Temple Mount "a sacred blasting cap" and by stating that "any incident at the site can spin out of control." But maintaining the peace in the volatile Mideast region does not appear to be high on the agenda of pastor John Hagee and other evangelical leaders now under CUFI's aegis. CUFI's first response, to the charge that the Dome of The Rock had been airbrushed from the image used in its logo was to deny it and claim the Dome was missing simply because of a question of perspective. In my April 14 piece though, I provided a number of pictures, of the same site- the Wailing Wall and the Temple Mt., which showed that claim was highly unlikely and even impossible. In a followup story, CUFI's Odd Case Of the Dome That Vanished In The Night, I discussed the outcome, as a New York Jewish Telegraph Agency news story stated, unequivocally, that the image had indeed been wiped. 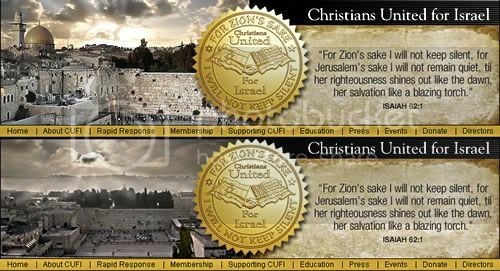 CUFI then changed its story and stated that the image had indeed been altered but not under CUFI's direction - the image, the group said, had been airbrushed by the artist who took the photograph from which the image was derived. 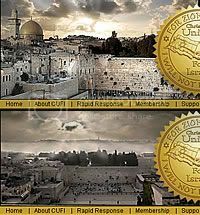 The suggestion was that CUFI's use of the wiped image was somehow "accidental" but in a Google image search of literally hundreds of different images, from a similar perspective, of the Temple Mount and the Wailing Wall, I was unable to fund even a single image from which the Dome of The Rock had been airbrushed. There were two likely conclusions: either CUFI had specifically searched for the airbrushed image or it had in fact commissioned the image in the first place. Now, before you think I'm attacking, please let me preface with the fact that I agree with most of the stuff on this site. I think the Dominionists are a threat to civilized society, I think they have a twisted agenda filled with hate-mongering and false precepts, and I think they intentionally took a photo from an angle that made it look like the Dome was gone. However... The angle of that photo was taken such that they're looking straight at the Western Wall. The line of sight is perpendicular to the Wall face. If you look at an OVERHEAD map of the area, and extrapolate where the camera probably was, then it's easy to see that the area you circled isn't the area where the dome should have been. The Dome is located at almost a 40 degree angle behind and away from the left corner of the Wall, and a fair distance behind. The line-of-sight lines that you drew didn't quite account for the actual changes in perspective. The edge of the Dome might have been airbrushed out, but if any part of the Dome would have been visible from that angle, it would have been a small part of it, and only on the very edge of the picture. The area you circled... just to the left of the trees... not where the Dome is. Please... do take a good analytical look at an overhead map and double-check your work. Google maps has a good one. The angles are easy to see, and from overhead, you don't get the strange mind-games that happen with on-the-ground perspectives. The reason that almost every picture of the Western Wall you found has the Dome in it is because most people consider the combination to be beautiful, tourist-worthy, and highly recognizable as the Jerusalem "skyline". It's like taking a picture of the basilica at Pisa, but not the leaning bell tower. While the basilica is a lovely piece of architecture in its own right, people always photograph them together. Very VERY few photos are taken of the Western Wall from straight-on angles. The one used in this clearly inflammatory logo was done intentionally, and was probably slightly photoshopped, but the dome was definitely not where you suggest it should have been in the photo. Gaaah, does this make me a twisted rendition of the devil's advocate? ...With pictures elaborating my perspective analysis. As you do, CUFI originally claimed this was an issue of "perspective". But, CUFI has since admitted its logo picture was airbrushed.